Waiting rooms are an important part of your company’s image as well as customer comfort. After all, your visitors perceive your service according to the attractiveness of your facility’s physical environment. But before discussing how you can make a waiting room that provides pleasant customer experience, we need to understand what processes your customer goes through until reaching that point. To really understand this, we asked customers of different industries (retail, bank, healthcare) what thoughts go through their head when entering a new facility. Interior design expert advice & tips from other respondents. Is this the right building? Make sure you have outdoor signage indicating the name and the function of your business. This might sound obvious, but we were surprised by the sheer number of respondents who complained about not being certain which building they were looking for. Having your company’s address registered online, with pictures available on the internet so that people could recognize it at a glance, is a great strategy. Sometimes things are not that straightforward, though. Due to various buildings, construction works or other unpredicted reasons your customers might find it complicated to find your company. Putting outdoor signs, such as your company’s name, that is easy to notice will smoothen the searching process for your customers. If you want to make it even smoother, consider putting outdoor signs on the way to your site that will indicate the direction where customers should go and perhaps the distance until the destination. Just like outdoor signs, indoor ones are equally important. Customers feel unsure once they enter your location. The feeling of uncertainty increases even more when the location is bigger and with a lot of visitors. With the appropriate signage, you can inform and direct your customers while freeing them from the stress of uncertainty. It also gives your customers the feeling of personal control, without the necessity of asking strangers for directions, and makes them more confident while visiting you. For giving more personal control, Qminder self-service software lets your customers sing in themselves. This does not only benefit customers but also your staff by freeing them for repetitive tasks and giving them more time to focus on more important tasks. However, certainty is not the only thing customers seek when interacting with a company. In fact, personal customer service is one of the most desired values that customers look for when choosing a business. One of the ways to tackle this issue is to assign a greeter at your location. This person will be in charge of welcoming your visitors and facilitating their journey at your site. Take a look at our video explaining how employing a professional greeter at your company will make your visitors feel truly welcomed. Do I have to wait much? Another reason why visitors get anxious is because they don’t know when will their turn be or how many people are waiting in front of them. Having a digital screen that will provide your visitors with relevant queuing information will enhance their waiting experience. They will stop the guesswork and be more certain about the wait time. In case of a simple service-desk scenario, it is recommended to place the screen towards the direction where the visitors are being served. People tend to look towards the service area, therefore, placing a screen there would be easier to notice. With Apple TV you can set up Qminder on your screen in a matter of minutes. Our video explains how Qminder TV can benefit your company and your customer’s journeys at your location. The waiting room is an inseparable part of the waiting experience (unless you want your customers to literally stand by… which you obviously shouldn’t). Having one is already a good start, but is it enough? Many companies think that putting a piece of mediocre furniture is all it takes to make visitors happy. Our respondents, however, told us a different tale. Customers have become more demanding, and in order to succeed, companies need to meet their high expectations. Our respondents and experts suggested some tips for upgrading the waiting room and making customers feel relaxed during their waiting. “There is a simple recipe in making an ideal waiting room, both for customers and you. They enjoy waiting, not hating it. How to do that? It’s simple. Use sofa chairs instead of metal or stool chairs. At least use a chair in which one can sit cozily. Provide the water within their reach by using a water dispenser, or a jug on the table. “The customer experience begins even before a client enters the waiting room. It starts when they consider to book an appointment, so to assume that care needs to be taken only once the treatment has begun is absolute folly, and you are missing out on more than 50% of your opportunity time with a customer. The aim is to purely entertain, inform and get your customers both excited about their visit and happy to be there. We do this by offering tea and coffee. This is just basic now. There should be a coffee machine available for your clients to help themselves. It is simply an incentive for you to get things done on time if you are worried they will sit and drink through several cups. Comfortable chairs, get rid of benches and hard-shell fiberglass stuff unless you want your customers to go away instead of waiting. Carpet — something that doesn’t show dirt (too badly), tile and linoleum are for police stations and the DMV. Clean and deodorize it frequently. Vacuum every day. Get some decent magazines which cover different subjects. No People, no mindless movie magazines, no 1936 National Geographics, no frilly women’s magazines. This is 2019, not 1919. Cover some unexpected subjects! I once found a copy of Astronomy magazine at a medical lab. I’m not especially interested in astronomy, but it did make the wait more tolerable. Don’t paint the walls institutional puke green — that’s for high schools and prisons. Be brave, experiment with colors… after all, all paint sells for the same price. Pictures on the walls — again, something distinctive, perhaps a bit unusual, don’t buy a painting because it is the same color and size as the couch. Art prints are cheap at any craft store, or you can buy some really good stuff from any museum shop on the internet. Lose the insipid inspirational posters or, better yet, burn them. Lighting — old, dirty, flickering fluorescent fixtures give people migraines (even if they don’t), and make a terrible impression. What kind of a run-down dump is this, anyway? Do I want to do business with these people? Nope, I’m gone, sayonara! Be a sport and buy some decent table or floor lamps, Ikea has all kinds of them for very little money, and they even look good (usually). Working wifi is a must. Bottled water (small bottles), perhaps a bowl of decent chocolates (name brand, not cheap stuff). Avoid petrified hard candy, someone will break a tooth on it and then sue you. Hard candy also looks like it has been in that same bowl for the last decade (or longer), and some of it has. Box of tissues. Trash can (small, with cover). Accessible outlets for cell phone charging or laptop power. If you really want to knock ‘em dead, fresh flowers in a vase - real flowers. Any business which can’t (or won’t) afford $3 a day to keep their customers happy and make them feel comfortable shouldn’t be in business. Burn the plastic plants along with the inspirational posters. If your customers or clients bring children with them, have a supply of inexpensive toys, stuffed animals and children’s books available, and consider them consumables. Ideally, the kids will be absorbed in video games on their phones, but you can’t count on that. Finally, make absolutely, completely, 10,000% sure your parking spaces, waiting room(s) and rest rooms are ADA compliant and fully handicapped accessible. There are lawyers who make a very good living indeed suing companies (and municipalities) for ADA violations, real or imagined. I’ve been in far too many waiting rooms that were so depressing that I wanted to jump out the window, they all use the same decorators as the local DMV. When I had retail businesses, I made SURE that anyone who had to wait for me was comfortable. After all, my customers pay all my bills, so I ought to be nice to them, right? Woah, am I the only one getting pumped by reading this passionate answer? Mike may have answered emotionally, but it shows how important your waiting room experience is. Remember that customers link your facility’s physical appearance, such as waiting rooms, to your service quality. Any unfortunate experience during the waiting process can be linked to your company’s overall performance. How do I know it’s my time? Apart from waiting, the reason your visitors might get nervous is that they might not know whether it is actually their turn to be served. “I always get worried when they put me on a waiting list as a number. Most of the times, these numbers don’t get served numerically, which makes things even worse. Make sure that your customers understand when their turn has come. With the Qminder queuing system, after you’ve called your visitor, you have a few options on how to proceed, depending on the circumstances. One of the options is to “call again”. This button displays a visitor’s name and plays a notification on the TV, to help you grab the customer’s attention. If you really care about your visitors and want to guarantee their comfort, consider using the Qminder SMS feature. 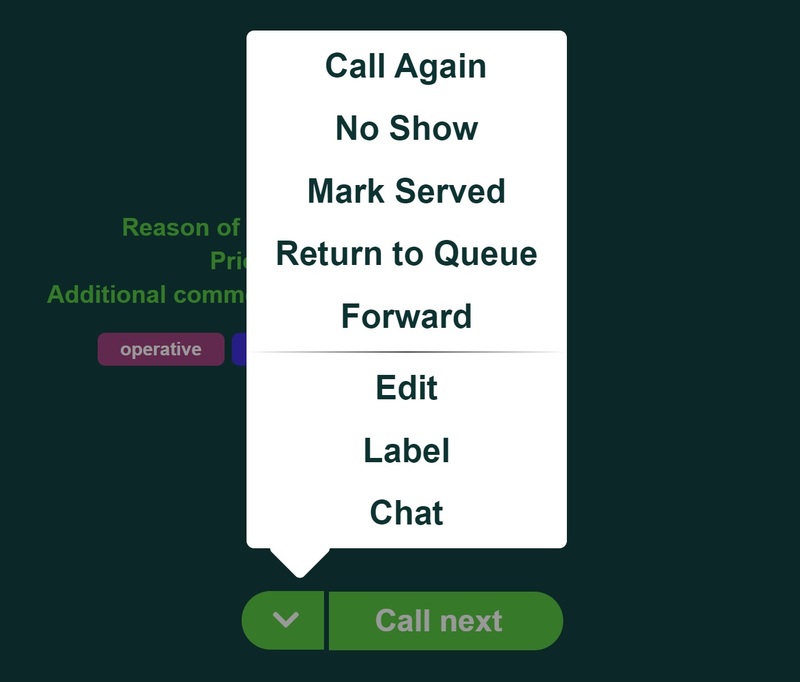 Sending your visitors text notifications regarding their waiting status will make them feel at ease and free them from the need to keep checking the screen every now and then. But apart from that, you give your customers the freedom of movement. Perhaps they want to visit a cafe next to your location? Or they got tired of sitting and want to take a small walk? Qminder’s SMS feature is perfect for ensuring that they can do so without sweating about missing their turn. As our respondents already mentioned, customer experience starts way before they enter your building. By offering them a pleasant experience both outside and inside the waiting room, you increase their satisfaction levels.